Our Magnet program has a focused theme of ACCELERATED ACADEMICS through Advanced Placement(AP) courses and Dual Enrollment(DE) courses. Magnet schools are typically more “hands on- minds on” and use an approach to learning that is inquiry or performance/project based. We use state, district, or Common Core standards in all subject areas, however, all are taught within the overall theme of preparing students for college(career) related paths. Our average class is 25 students per class. To apply for your spot at Woodlawn High School, follow these two easy steps. Submit the following documents by uploading them with your online application or drop them by the school office in person. Qualifying applicants are chosen through a computer-based lottery system and notified of acceptance. 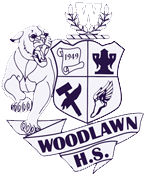 Current Woodlawn High School students, applicants living in the Woodlawn High School attendance zone, and siblings of current students will have priority admittance to the Woodlawn High School Magnet Program. If you would like more information about this program or have any questions, please contact Mrs. K. Watson, Magnet Coordinator, at 225-753-1200 or kadams@ebrschools.org. We can provide you with a school tour upon request.